The suicide awareness programs for everyone – Tell, Ask, Listen, KeepSafe (safeTALK ), and its advanced brother – Applied Suicide Intervention Skills Training (ASIST), have been around for many years. The need to incorporate suicide awareness training early in our Welfare and Compensation Advocacy training has been identified during the Younger Veterans’ Wellbeing Workshops. As a result, we are now incorporating safeTALK into the Level 1 training package. ATDP intends to build its own capability to present safeTALK, and have accredited presenters internally so we do not have to rely on organisations such as Lifeline for trainers at our programs. An email to our National Training Manager ntm@atdp.org.au indicating your interest will be appreciated. There is also a safety requirement at these programs that a suitably qualified support person be in attendance to assist in the event that a participant has an adverse reaction to the training and requires counselling and support. There may be opportunities to provide such support not only locally but also interstate (with expenses met by ATDP). Prolonged exposure (PE) therapy is a gold standard treatment for posttraumatic stress disorder (PTSD). 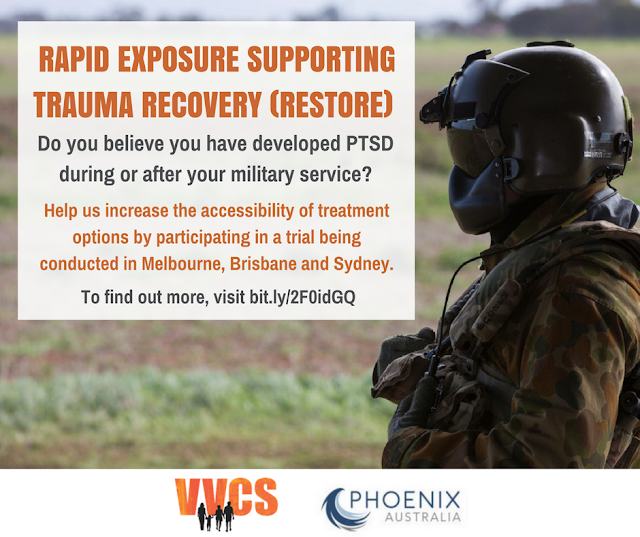 In its current form, this therapy can be difficult for current and ex-serving ADF personnel to commit to, as treatment usually takes 10 weeks to undertake. In partnership with Phoenix Australia and the Department of Defence, the Rapid Exposure Supporting Trauma Recovery (RESTORE) Trial is investigating whether the outcomes of an intensive delivery of prolonged exposure therapy (10 sessions over a two-week period) is as effective as the current 10 week format. Regional Manager, Regional Implementation Group (RIG) 2: NSW, ACT and WA. The Regional Manager, who will also be a member of the Capability Framework Management Group, will lead the RIG to deliver strategic objectives and goals in the implementation and operation of the ATDP at the regional level, within the agreed parameters set by the SGB and the CFMG. While experience in the provision of military welfare and compensation advocacy services will be well regarded, as would formal training qualifications, the prime requirement is an interest in and time available to support the operation of ATDP and the training of the next generation of advocates. • Please send your application to ATDP.Communications@dva.gov.au by 2400 AEDT on Friday, 13 April 2018. If you require more information about this role, please contact Roger Greene, A/g CFMG Chair, on Mobile: 0411 431 189 or by email: cfmgchair@atdp.org.au.